Archaeological findings from the end of the 11thcentury confirm the small settlement on the Chateau hill of Mikulov. It probably served the protective purpose, which helped to protect the new Moravian-Austrian borderline. This simple construction burnt down later. Apparently, Přemysl Otakar I, the King of Bohemia, or his brother Vladislav Jindřich, the Margrave of Moravia, ordered to build a stone castle on the lime rocks above the village in the 13thcentury. In 1249, Přemysl Otakar, the Moravian Margrave and later Ottokar II of Bohemia, the King of Bohemia, gave Mikulov to Heinrich of Liechtenstein. 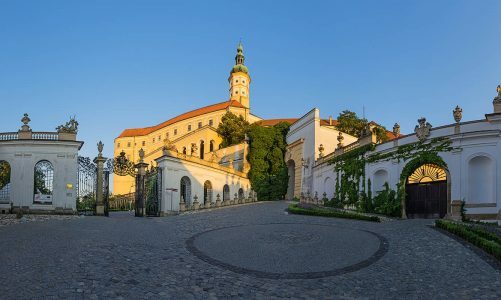 The medieval history of the Mikulov castle is closely connected to this Styrian aristocratic family. The most preserved gothic part of the castle is the octagonal chapel from 1380. The Liechtenstein family owned the Mikulov estate until 1560, when it was acquired by the Kereczényi family for a short period of time. From 1575, it was owned by the Dietrichstein family, who kept it in their possession until the end of World War II. The castle was rebuilt into a presentable Renaissance chateau during the reign of Cardinal Franz Dietrichstein (1570–1636). Further rebuilding was made during the 18thcentury, mainly as a result of a serious damage caused by a fire in 1719. The baroque theatre building, which is nowadays a historical library with more than 11.000 books, was also restored in the rebuilding process. World War II marks particularly tragic moments in the history of the Mikulov estate. In the very end, on the 22nd1945, the chateau was once again damaged by a fire. The chateau was restored during the 1950s with the sensitive regards to the original baroque appearance. The Regional Museum in Mikulov owns the chateau and manages and operates the buildings.